Value for money is probably the last thing on your mind when trying to achieve the best in home hi-fi and sound quality. Of course you have a budget to work with. You have spent much time and effort researching and listening. Finally, you believe you have found what you have been looking for. You sit back in your listening chair and the music sounds oh so sweet, but how long will you be enjoying sweet music before the first repair and how much will the repair cost? How many years do you expect to be able to listen to sweet music, trouble and maintenance free? First purchased September 2003 from KJ West One in London for £1596, my beloved MartinLogan Scenario’s provided many years of musical fulfilment. These speakers allowed me to truly appreciate my love of ‘real’ music. Aesthetically Transparent and musical transparency are words commonly used to describe both physical attributes, as well as the musical experience with these speakers. I fell in love with their truly uncoloured ‘non-speaker box like’ attributes. They just worked in my ‘difficult to manage’ listening space. 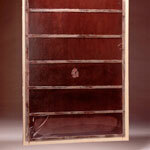 Back in 2003, very little online information was available regarding the lifespan of MartinLogan electrostatic speakers (the coated mylar panels to be precise). There were whisperings of possible degradation ‘over time’ caused by high humidity, dust, smoke as well as the high electrical charge required to energise the panels (particularly with earlier models). However, I was far too engrossed by what I could now hear and feel within the four walls of my listening room to be concerned about whisperings outside. I also always took great pride in ensuring the panels were cleaned (as per MartinLogan instructions) and being a non-smoker, I felt extra confident of trouble free ownership. Today the internet is awash with various professional and home customer threads describing both ‘joy and pain’ using MartinLogan electrostatics. If I had known then what I know now, would I have I travelled down the electrostatic route? 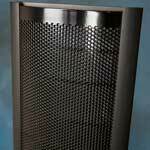 MartinLogan electrostatic owners who have fallen foul of the MartinLogan replacement panel price hike. 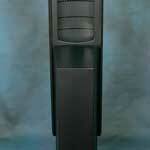 In 2012, MartinLogan confirmed they were tripling the price of panel replacement. I was advised by one of their distributors that price hike was due to the high failure rate during production of the panels. In 2010, MartinLogan announced they were going to discontinue supporting older, out of production so called ‘legacy’ products, however, this was a brief (and obvious ridiculous own American football goal) to which they quickly corrected. 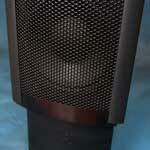 Still, visit the MartinLogan website and you will notice the absence of part replacement information. After virtually hours of web surfing, I did note one owner in the US paying over $700 for panel replacement! 2015, hints of degradation began with a confusing uneven response from the speakers. Music began to sound left sided (which obviously varied depending on the recording) however, generally this was more noticeable with time. The balance variation made me question many recordings (and many a sound engineer’s state of mind). I also questioned other components in the chain such as amplifier, pre-amplifier, phono stage… during the long degradation period. The MartinLogan Scenario speaker breakdown finale happened towards the end of October 2018. This time it was clear (or perhaps not). A complete loss of three-dimensionality, dynamics and high frequencies! B. Purchase a new, completely different type of speaker? 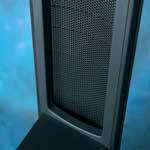 While continuing to explore panel replacement options with MartinLogan in the US, Absolute Sounds’ (as well as other online companies offering Scenario panels) I considered the possibility of living with a different brand of electrostatic speaker, such as the Quad ESL range, or Magnepan, as well as the possibility of different type of speaker altogether? 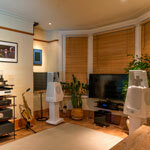 My exploration led me towards a pair of MBL 120 Radialstrahler Loudspeakers (£15,500). (Supplied by AudioEmotion). 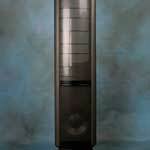 Expectations were high after a brief foray with the bigger £180,000 MBL 101 E’s at the 2008 Audio & AV show. My initial thoughts after a careful (but brisk) set up of a pair of MBL 120 speakers (supplied by Audio Emotion) was “oh dear”. Not what I was expecting in any shape or form. They offered an inviting wall of sound when playing back the likes of the Mike Oldfield’s “Tubular bells,’ or Pink Floyd’s “Dark Side Of The Moon,” but spin a disc with subtle variations in emotion such as Herbie Hancock’s “Maiden Voyage, or Wayne Shorter’s “Adam’s Apple) and you will wonder if Hancock (piano) or Shorter (saxophone) were emotionally distracted during these sessions. There was also a distinct lack of musician placement, instrument textures, or any distinct soundstage whatsoever. After hours of repositioning attempts later… I soon decided the MBL 120’s just did not suit the limited space and close wall positioning I had on offer. As with all components, individual taste, component matching, room set-up become part of the mix! 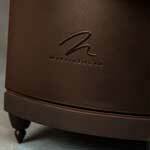 All roads lead back to my MartinLogan Scenario electrostatics! April 2018, the replacement panels for my MartinLogan Scenario electrostatic loudspeakers finally arrived (a full 10 weeks after placing the order with Absolute Sounds). 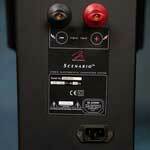 The cost of a new pair of Scenario panels? £1098! After such an excruciatingly painful wait, I collected the panels from Absolute Sounds in South London and with the invaluable assistance from an experienced friend, we carefully fitted them within two hours! With speakers back into their marked positions, we eagerly sat down to listen. The advisory run-in period for these new panels is around 48 hours. Hence our initial ‘hand over ears’ experience. The harshness and brittle presentation left my cat’s ears retreating flat to the back of her head. After a few days of continuous Tellurium Q System Disc CD playback, I was in electrostatic heaven once again. Fast forward to early February 2019 - groundhog day! After less than eleven months of near audio bliss, my ‘new’ Scenario loudspeaker panels suffered the same fate as the original pair. I Know face another gruelling 10 -12 week wait for replacements. 14 March 2019, the following email communication as sent to MartinLogan. It is unfortunate (understatement) that the Scenario electrostatic replacement panels sent to me (April 2018) for my Scenario speakers have failed. It is also even more unfortunate this failure has occurred in less than one year of receiving them! Your UK distributor (Pedro from Absolute Sounds) has suggested the failure could be due to the panels living in a ‘smokers environment’, or their particular placement could be near a wood burning or coal burning fire. He came to this conclusion because he claims he has found some sort of ‘debris’ within the mylar panel. Let me be absolutely clear… We do have many music lover listening sessions here (in my home). However, being a fitness fanatic and gym freak for 40 years (I am 54 years old) smoking is completely alien to me. I have lived at my address for 20 years (the time I have owned these speakers) and nobody would be brave enough to light a match (further more cigarette) anywhere near my home. I am also allergic to ‘dust mite debris’, so my home is cleaned at least once a week. I have attached a photograph of the set-up for your perusal! We are in the process of testing new components to add to our system, so this failure could not have come at a worse time. As we are unsure how long it will take for replacements to arrive. Our previous wait (just last year) was ten weeks, so we are considering returning all components we are currently testing as they are on loan! I finally took delivery of my repaired Scenario ESL’s today. After sending various emails, leaving a message on the MartinLogan Service Department answering service, various emails to Absolute Sounds, firstly requesting repair and delivery dates, then advising I would prefer a refund after no, or inconsistent responses. In February, my Scenario’s were delivered to Absolute Sounds in Wimbledon in near mint condition, completely scratch free. Unfortunately they have been returned to me with a few marks and one deep scratch to one speaker cabinet. I also never did receive a response from MartinLogan either by email or telephone call. What a superb high end service by both main company and UK distributor. Absolute Sounds…Absolutely Scandalous!